Three things that make our world go ’round are prime steaks, a Sinatra soundtrack, and premium cigars. And they all aligned on this weekend’s live broadcast from Bob’s Steak & Chop House at the Omni Tucson National Resort! Our celebrity co-host was our resident Scotch mentor Thom Wadlund, who took us on a waltz around the malts and offered his picks for seasonal Scotches. We also caught up with Jeff Reisinger of Adventurous Stills Distilling in Tempe, who talked about a new limited-release, cask-aged rum. Omni general manager Jeff White then announced his plans for a Duckhorn Vineyards wine dinner. Quack-worthy, of course! 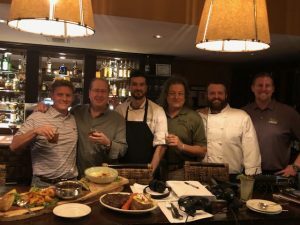 We were also joined by Chef Mark Evanoff of Bob’s and the Omni’s Executive Chef Jonathan Stutzman, who got us current with the delicious things happening property-wide, including the upcoming 10th anniversary of Bob’s. We tasted through some spectacular dishes on this show! 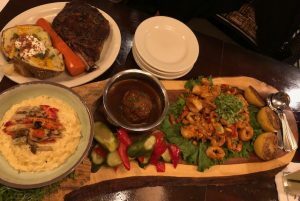 Our tasting featured a landscape of culinary love, with a lobster and mushroom risotto, a 9-ounce prime meatball, fried calamari, and the iconic Cote du Boeuf ribeye steak! See you soon at Bob’s!